become available, they will be presented in this series of reports. perpendicular, and perpendicular or parallel to the edg:e of the plate. choice of axes in Thov.wn in figure 1.
sive report apply to such material. mate formula in which the error is very sliht is obtained for E I : t-kin! determines the stiffness of strips parallel to the side b.
grain of the face plies perpendicular to the length of the strip. the ith ply and h is the thickness of the strip. the length of the strip. are such that the deflections do not exceed the thickness of the -late. ilarly loaded very long late (infinite strip) of width a and of thr. of a b, r,-, of unit with inlrr a uniformly distribut e loa. 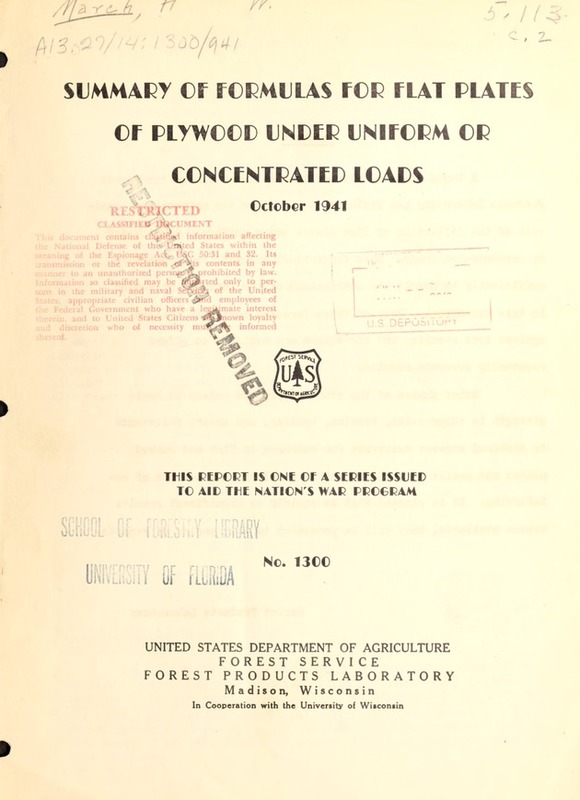 using, the elastic constants of spruce, for various types of plywood. Th. ing tests of strips of matched material. at first sight arpears to be impossible, is found in the exact analysis. by the deflected surface of a plywood plate. too small, a fact vhich he recognized would be the case. may be used for wood of other species as point'cd out in section 3.
formulas and curves of this report are not restricted to such plates. at the center. Edges simply supported. calculating this constant is to be found in the extended retort. are assumed to be restrained from moving in,, ar..
only the moduli 31 and 'Ea enter. This is the mean direct stress averaged over the thickness of the plate. the prolict of this strain and Ex at the roint under consideration. tion of such a plate. 7. Infinite strip. (Long, narrow plate). cable if the plywood is made of wood of two or more different srcies. a a (2) is-greater than 1.5. UNIFORM LOAD. EDGES SIMPLY SUPPORTED. WHERE B =b (E,/E2). UNIFORM LOAD. EDGES CLAMPED. A} ALL PLIES SAME THICKNESS. B=b(E,/E). CONCENTRATED LOAD. EDGES SIMPLY SUPPORTED.